Anti-aging skincare company StriVectin has the newest solution to your search for youth— as long as you're down with wearing a walkman-looking contraption on your face. StriVectin is introducing their first device, a Facial Toner micro-current which was inspired by the treatments given to victims of facial trauma. The device, which is FDA approved—hopes to "preserve facial muscle mass." According to executives, most at-homebeauty devices use micro-current technology that is subsensory and only stimulates blood flow. The Facial Toner is said to directly target facial nerves and muscles, utilizing 30 milliamps, which is equivalent to 30,000 microamps. "It's hard to target the deeper tissues and this helps that," said Dr. Neil Sadick, who led the clinical trials for the tool. 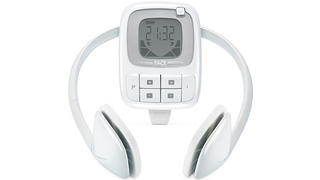 The hands-free device, which resembles a Walkman complete with a headset and radio, delivers treatments through soft medical-grade gel pads on either side of the face. Dr. Sadick told Women's Wear Daily that the Facial Toner should result in stronger, firmer skin. StriVectin is partnering with Ulta stores to promote in-store training on the device so women are able to learn what the hell to actually do with this product. The Facial Toner will retail for $199. Their pitch is basically that $200 is still less than a facelift. The device will be available online at the end of August and in Ulta stores for three to four beginning in September. In a prediction that is both surprising and not at all suprising, industry sources claim that the "Facial Toner is expected to do around $8 million globally in retail sales this year." Can you use it in conjunction with the IlluMask?